Here learning is active, engaging, meaningful. We do more than memorize facts. We experience them. We go beyond what. We learn why. Through special art days, theatric puppet shows, music events, and other hands-on activities, our Jewish stories and history come to life. Here we explore a range of subjects including mitzvot, history, Hebrew, and prayer. And because our approach welcomes diversity of thought in all subjects, students learn so much more. They learn to assess differing views. They learn to learn—to think for themselves. Our students emerge with a deep understanding of Judaism—one that gives them the tools to develop their own individual beliefs and practices. 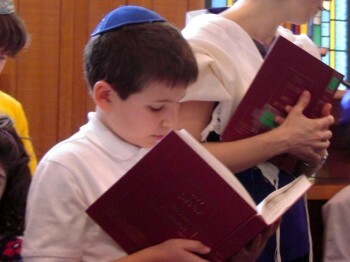 They learn what it is to be part of a Jewish community. 3rd-7th Grade: 9 a.m.-1 p.m. The mission of the Kehillah Religious School is to provide knowledge and experiences that foster a strong and positive Jewish identity and community, and assist students and their families in living joyful and meaningful Jewish lives. Students maintain involvement in the community by assisting in the school, joining the Kehillah Youth Group, and/or attending Midrasha, the Community Jewish High School program. For an in-depth look at our core beliefs, click here.